There are many reasons for ankle pain, some of the most common include a history of ankle sprains or trauma. Trauma or sprains can often result in inflammation of the ankle joint or damage to soft tissue structures like ankle ligaments or tendons. 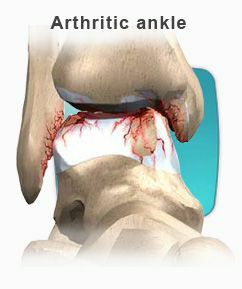 The anterior talar fibular ligament or peroneal tendons are often injured with sprains. Patiens often relate a stiffness, popping or catching of the ankle as part of there symptoms. These can be attributed to other causes including arthritis of the ankle or damage to cartilaginous surfaces. There are a variety of treatment options from conservation care to surgical reconstruction.